I recall that it was in New York in 1980, when I was Bhutan’s permanent representative and ambassador to the United Nations that Dale Djerassi1 interviewed me for the 1982 PBS documentary, Bhutan- A Strange Survival. One of the questions put forward was: Who is a Bhutanese? I was confronting this question for the first time. The question was rather strange as the answer otherwise seemed obvious, at least to me. But then, some could ask such a question to try and obtain a deeper insight into a country’s people, background, and laws relating to citizenship. How would Dale Djerassi respond to the question: Who is an American? Was there a distinction between a United States citizen and an American2 ? Usually the law of the land makes it clear as to who qualifies as a citizen. But then again, it dawned on me that countries do have issues in giving recognition to certain categories of inhabitants, not counting illegal immigrants issues that are not possible to simply ignore. At one point African Americans in the United States were not considered full citizens, but after generations of slavery they were emancipated and given legal recognition both as fellow human beings and citizens. But the African origin peoples had been in America, although as slaves, for centuries almost as long as their European counterparts. So their descendants prima facie qualified as “sons and daughters of the soil” as much as the Whites. Despite their birth in the same country it took a long time for them to be given full legal citizenship. It was only in 1965 that under the US Voting Rights Act that the African Americans were given the opportunity to exercise their citizenship rights. However, the African Americans, even in the 21st century, still feel a strong sense of discrimination, as in practice, as they say that they are discriminated against in subtle and complex ways3 . The so-called “Native Indians” were the original inhabitants of the Americas and they would be the first “real” or aboriginal Americans. Their legal status as citizens in politically and militarily white-dominated United States took a long time to be legally recognised, but they were more “American” than the latter day White settlers by all accounts . When considering a question like who is a Bhutanese, American, Canadian, an Indian, or any other nationality, it is necessary to understand by briefly examining the issue of the larger perspective that different countries have, and the practices prevalent on citizenship matters. For instance, in today’s context one cannot say one is a Bhutanese if one is not legally recognised as such. In various other countries there are situations where persons are recognised as citizens by the prevailing laws of the land, and others who are in every other way born inhabitants of the land but laws, or the government policies at a particular point in time, do not give them recognition as full citizens. This could be due to race, religion, or sometimes language or economic and social reasons not palatable to the ruling elite and their lawmakers. This was so in the case of the erstwhile apartheid South Africa, German South-West Africa (Namibia) and Rhodesia (Zimbabwe). In the mid-twentieth century, the world witnessed the Holocaust the wiping out of six million Jews by Adolf Hitler’s Germany simply because of their race and religion. Nearer home, and in the present times, we hear about the Muslim Rohingyas from the Rakhine state in Myanmar, who, by some accounts, are said to be immigrants from Bangladesh. The Rohingyas are ethnically different from the majority Buddhists in Myanmar, and have no political clout. The current government has not given them recognition as citizens despite international pressure. There are many examples around the world where inhabitants who, by all counts, should be regarded as full citizens are not recognised as such, and instead given an alien or inferior status. Things have, however, been changing around the world. We know that 20th century history has taught rulers of nations hard and important lessons in statecraft. One of these critical lessons relates to the preemptive acceptance and accommodation of diverse groups in a country, and the recognition that all inhabitants should be given the same rights and duties as stakeholders in the country of their birth. The national dilemma on citizenship needs to be sorted out by rulers before further trouble brews in their states. Though not exactly pertaining to citizenship, presently we see this taking place under India’s “Modi sarkar” or Prime Minister Narendra Modi’s government, which is making every effort to be inclusive despite its proclaimed Hindu religious leanings. In governance it is necessary to understand simple human psychology. The moment the status of citizens is put in doubt, and the equal acceptability of the different types of persons in a country are questioned, the character of that society undergoes a change, sometimes in a dramatically adverse way. We have seen this happen all over the world in the United States, largely because of the differences arising from the colour of one’s skin; the Sunni-Shia divide in Iraq, the Palestinians and Israelis in the Middle East, and earlier, the persecution of the Jews in Europe. Closer home, we have seen the consequences of the Hindu-Muslim divide on the Indian subcontinent first encouraged by the divide and rule policy of colonial Britain; and in several other versions in other parts of the world. To avoid a chaotic national state of affairs from emerging, equal opportunities in a country’s economy, polity and governance structures for all citizens is an absolute necessity that States should approve, consciously promote and implement. Otherwise, their inhabitants will be working at cross-purposes, and their loyalties to their own country will get diluted. This can result in the disruption of social harmony, undermining of national peace and stability, and worse still, in the growth of terrorism and violence. Once such a situation is allowed to evolve, wittingly or unwittingly, it is difficult and time-consuming to reverse it, and insecurity could become the order of the day. However, it is heartening to know that internationally, despite the great hurdles still present, we are moving towards “many nationalities, one humanity,” in a world that is becoming irreversibly more interdependent, integrated and globalised. While preservation of culture and tradition is acceptable, closed societies, exclusive ethnic groups attempting to keep the rest out, and walls erected by religions may not be feasible any more. The United Nations, at least in principle, has been working for the last 60 years towards such a “one world, one humanity” objective. The United States, western European countries, and secular India and Singapore in Asia, have achieved many legal successes in this regard, and the thinking of their peoples is also undergoing change in support of eliminating all forms of discrimination both in their countries and regions. It is in this context that the Bhutanese monarchy, with its attributes of the Buddhist and universal human values of kindness, compassion, tolerance and generosity, has found solutions to overcome differences amongst the people relating to ethnicity, culture, religion and religious sects, way of life and languages. Bhutan was not without its problems and misunderstandings, but solutions based on human values were effectively found to the issues that arose in 1989-1990 in the south, and the east5 . As history informs us6 , Bhutan too is largely a land of immigrants. The vast majority of people in the western part of the country seem to have originated in the Tibetan region. Zhabdrung Ngawang Namgyal (1594-1651 CE), the founder of Druk-yul, that is, political Bhutan with recognised physical boundaries, and his followers, came from Ralung in Tibet to Bhutan in the year 1616. They formed the country’s first “national” government. Other supporters in the country were those belonging to the Drukpa sect brought in centuries earlier by Phajo Drukgom Zhigpo7 . It could also be said that many of the inhabitants in the central and eastern enclaves of Bhutan have their origins in Tibet, though some sources refer to their coming from the Indo (Assam)-Burma region as well8 . Several prominent eastern families trace their ancestry to the exiled ninth century prince Tsangma from Tibet’s royal family, or to prominent religious figures in the Tibetan area. So much so that we could safely say that the inhabitants in the traditional northern half of the country had strong ethnic links and origins to various regions of Tibet, and the largely differing mongoloid features, some fair and tall, some with sharp features, some dark and short, can also be attributed to IndoBurmese affiliations. Studies carried out on ethnicity, spoken languages and dialects, show religious links to especially the original places of the Nyingmapa, Sakyapa, Kagyupa and Bon traditions demonstrating nexuses to the Tibetan region. Then you have the Southern Bhutanese or Lhotshampas who are a mixture of both varying mongoloid and South Asian peoples, but all of Nepali origin, and whose settlements were sanctioned to create a buffer in the border region against the intrusions of British India. 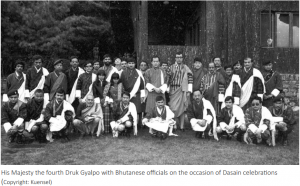 Bhutanese political culture, system of governance and dominance by the followers of the Drukpa sect was largely the result of Zhabdrung Ngawang Namgyal having founded the Drukpa Kagyupa state in Bhutan. Hence, in the traditional interpretation “Drukpa” meant the follower of the Drukpa religious sect, including those outside Bhutan like in Ralung and Ladakh, and did not connote citizenship9 . If you followed the Nyingma sect you were Nyingmapa and usually the main (tsawai) lama would be of Tibetan origin like Dudjom Rinpoche, Gyalwang Karmapa, Dilgo Khyentse Rinpoche or Dodrupchhen Rinpoche. Similarly there was the Gelugpa, and hence the follower of the Dalai Lama’s sect. The term “Drukpa” therefore would have excluded followers of other sects like Nyingmapa, Sakyapa, Gelugpa and Monpas resident in the Bhutanese area. Then later, with the establishment of a modern state under the Wangchuck dynasty since 1907, and in the political context, “Drukpa” came to mean a citizen of Druk-yul or Bhutan, irrespective of religious and ethnic affiliations. From a legal point of view, the first 1958 Citizenship Act came to include the Southern Bhutanese of Nepali origin. However, the third Druk Gyalpo had already established an exclusive administration for this part of the country since 195310. The government had recognised the legality of the settlements decades earlier through grants of land, levying of “dhuri” or residential house taxes, construction of Hindu temples, and educational facilities. Before the 1958 Act, there does not seem to have been a specific legal instrument defining who exactly was a citizen of Bhutan. There were no central registration procedures or records till much later in the 1970s when trained personnel became available, and computers were introduced to handle large amounts of data more reliably. Only the records of births and deaths, if at all maintained by villages prior to the Act, could have been considered applicable. For sure, written documentation to track the authenticity of the inhabitants had been maintained in Southern Bhutan until the commissioner system was abolished in the 1970s. These records later proved helpful in the identification of citizens versus those who had entered the country without specific official sanction. Then there was the subsequent Bhutan Citizenship Act 1985 which provided a legal definition of citizenship. The objectives of Bhutan’s development philosophy of Gross National Happiness (GNH), and especially its historic 2008 Constitution granted by the fourth King and pursued actively by the present Monarch, are clear manifestations of pursuing peace, progress and development with human values. Internationally this was glaringly recognised when Bhutan was placed 16th out of 162 countries in the 2014 Global Peace Index. This is an objective international assessment and Bhutan is now ranked above countries like the Netherlands, Germany and Singapore. Bhutanese attribute the kingdom’s success of achieving unity, peace and progress, while actively preserving the country’s valued traditions, to the principled and steadfast role of the Wangchuck dynasty. When the 2008 Constitution of the Kingdom of Bhutan came into being it embodied the citizenship provisions of the earlier Acts. Article 6 of the Constitution is titled “Citizenship,” and who is a citizen is outlined there. The Constitution provides for three categories of citizenship. First, “natural born citizens” are offspring of parents where both are citizens14. Second, “citizens by registration” are those who had been domiciled in Bhutan as of 31 December 1958 by showing registration in the official records of the government. This latter category was mainly applicable to Southern Bhutanese, though by implication their children would subsequently be “natural born citizens” if both parents were citizens. Third, “citizens by naturalisation” are those who have applied for, and were granted, naturalisation. Naturalisation requires applicants to have resided in Bhutan for at least 15 years with official permission; have no record of imprisonment for criminal offences within the country or outside; can speak and write Dzongkha; have a good knowledge of the culture, customs, traditions and history of Bhutan; and have no record of having spoken or acted against the tsa-wa-sum. They must also renounce the citizenship, if any, of a foreign State on being conferred Bhutanese citizenship; and take an Oath of Allegiance to the Constitution. The grant of citizenship by naturalisation takes effect by a Royal Kasho of the King. The Constitution prohibits dual citizenship. If citizens of Bhutan acquire another citizenship, their Bhutanese citizenship is terminated. The power to regulate matters on citizenship is vested with the National Assembly, subject to the Citizenship Acts. What has been argued in this article only expounds on what His Majesty said so succinctly and explicitly. The Bhutanese people in future It is my prediction that Bhutan will not permit any sizeable immigration or grant of citizenship to large numbers in the future. It should be noted that substantive migrations into Bhutan for purposes of permanent settlements after the Lhotshampas established the buffer in the south, have not taken place for more than half a century, except for grant of few individual citizenships through Royal Kashos, mostly to foreign spouses. This means that those currently registered as citizens, whichever part of the country they may be from, or whatever ethnic, linguistic or religious group they may belong to, will form the core of this kingdom’s citizens. With foreign marriage regulations being stringent, the Bhutanese will tend to marry each other rather than foreigners. This should enhance integration, and the process is likely to be rapid in view of the small population facilitated by all forms of connectivity, increased urbanisation and mixed rural settlements. On its part the state and government must continue to emphasise their policies that forge a single nation through greater understanding and unity. Integration must be emphasised and, among other things, through the promotion of Dzongkha as the single national language, the gho and kira as the national dress, ensuring the proliferation of the traditions and culture of Drukpa Kagyupa that gives Bhutanese their unique character, but at the same time respecting the prominent regional cultural and social traditions, as well as the individual preference for religion. Such a forward-looking policy promoted by Bhutan’s monarchs will enhance unity and bring Bhutanese closer to each other as one nation, one people. The democratic government that will make every citizen proud to be a Bhutanese will be the successful government achieving the goals of GNH. So, who is a Bhutanese? Permanent Representative of Bhutan to the UN and ambassador to a number of countries. He was the first Chairman of Druk Holdings & Investment. He is the author of Bhutan – The Roar of the Thunder Dragon. 1 Founding trustee of the Djerassi Resident Artists Program in Woodside, California. Also serves on the board of directors of the San Francisco Film Society. 2 Here I refer to American as a US citizen. However, “American” also seems to be politically charged. A South (Latin) American once told me that the US uses “American” to refer only to US citizens, and call their country the “United States of America.” But in fact, this gentleman told me, all those from North and South America are Americans, but not necessarily from the US! 3 See: racism.org. Accessed on November 1, 2014. 4 US Congress granted citizenship to Native Americans in 1924. 5 The problem in the southern part of the country related to illegal immigration and landholdings. In the east, the problem was the result of religious activities of foreign personalities. 7 Phajo Drukgom Zhigpo established the Drukpa religious sect that originated in Ralung, Tibet, in the Bhutanese area. He was born to father Dawa Zangpo and mother Pelmo Kyid at a place called Babchu Trashigang in the eastern region of Tibet, i.e., in the Kham province, in the year 1184 CE. 9 This interpretation still holds good for followers of the sect outside Bhutan such as Ralung in Tibet, and Ladakh, as well as followers of the Gyalwang Drukpa Rinpoche in India who are not necessarily from Bhutan. 11 Adrienne Louise Clarkson is a Canadian of Chinese origin who served as the 26th Governor General of Canada. 12 These tenets are: Generosity, ethics, tolerance and perseverance according to Adrienne Clarkson. 14 When the second category is “citizenship by registration” it implies that “natural born citizens” need not register, and written records may have been practically non-existent. This was the case earlier, but in today’s system in Bhutan, births have to be properly registered with the local administration otherwise later on it proves difficult to obtain Citizenship Identity Cards. When the second category is “citizenship by registration” it implies that “natural born citizens” need not register, and written records may have been practically non-existent. This was the case earlier, but in today’s system in Bhutan, births have to be properly registered with the local administration otherwise later on it proves difficult to obtain Citizenship Identity Cards.